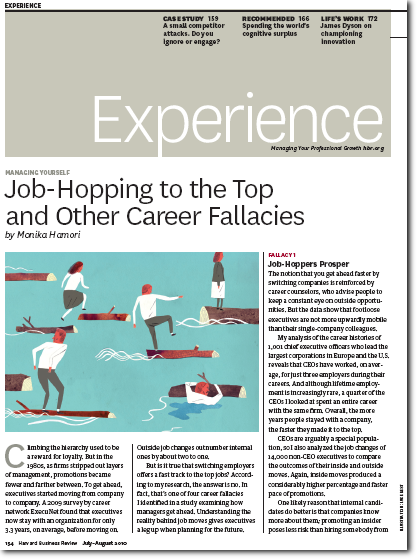 "Managing Yourself: Job-Hopping to the Top and Other Career Fallacies", by Monika Hamori; from the July–August 2010 issue of HBR. 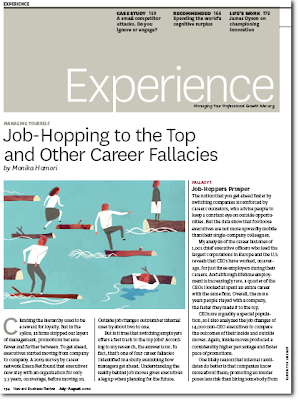 Job hopping does not lead to any faster career growth than staying put at the same company. So says this article. Not happy news for job sites. Not happy news for headhunters. Not happy news for employees. Not happy news either for the recruitment departments within companies either. Good news however for organizations looking for stability and for managers. My analysis of the career histories of 1,001 chief executive officers who lead the largest corporations in Europe and the U.S. reveals that CEOs have worked, on average, for just three employers during their careers. ...I also analyzed the job changes of 14,000 non-CEO executives to compare the outcomes of their inside and outside moves. Again, inside moves produced a considerably higher percentage and faster pace of promotions. It seems that both executive search firms and search consultants are also likely to evaluate candidates more positively and more likely to shortlist those candidates who have worked for longer at firms. Anecdotally also, this should be borne out by a simple observation of the people who have stayed at a company and of those who have left over the years. The second fallacy busted is that "A Move Should Be a Move Up". Not true. ... large promotions (that is, considerable jumps in both title and employer size) were relatively uncommon— less than 5%. Brands matter. Brand value matter.